The scene at 14th and Broadway, noted as the Occupy Oakland epicenter, has grown in numbers as the morning wears at today's general strike. With chants of "take the streets, take the streets" and "shut it down," all types of people from varying backgrounds have come to show support for the Occupy Wall Street movement. KCBS reports, "Nurses, union leaders and teachers are among the many expected to turn out for today's general strike called by Occupy Oakland protestors." So far the scene is peaceful. However, as The Oakland Tribune points out, today's general strike could be the biggest public demonstration on the East Bay since the Vietnam War. According to KRON, there are no police officers in the immediate area... at least as of 9:30 a.m.
Local banks are open, but their doors are closed and customers must pass through security to enter. The Port of Oakland has asked its employees to continue working throughout the day. Mayor Jean Quan, who has come under fire from both protesters and Oakland police alike, asked her staff to take the day off in support of the movement. This has, of course, sent mixed messages to the Oakland Police Department, which prompted the Oakland Police Association to release this scathing statement aimed at Quan. Stay tuned to SFist throughout the day. We'll update with images and more during the general strike. 10:03: Who changed the name of Frank Ogawa Plaza? Over on Google Maps, the name of the noted plaza has been renamed after Oscar Grant, one of two pin-up men the Occupy Oakland movement have canonized. Grant, if you recall, was shot and killed by a BART police officer on New Year's Day 2009. 10:15: Some downtown Oakland merchants are going cash-only today, so as to not support the credit card companies. Example A: B Restaurant and Bar in Oakland. 10:25: Google Maps switches back Oscar Grant Plaza to Frank Ogawa Plaza. A reader-edit snafu was to blame. 10:37: Oakland MayorJean Quan issued a statement today saying that she wants a peaceful general strike that "puts the issues of the 99 percent front and center." Quan adds, "I am working with the police chief to make sure that the pro-99 percent activists -- whose cause I support -- will have the freedom to get their message across without the conflict that marred last week's events." 11:05: Scores of Oakland schools have closed for the day. Also, according to NBC Bay Area, hardly any police can be seen at the general strike epicenter at Frank Ogawa Plaza. 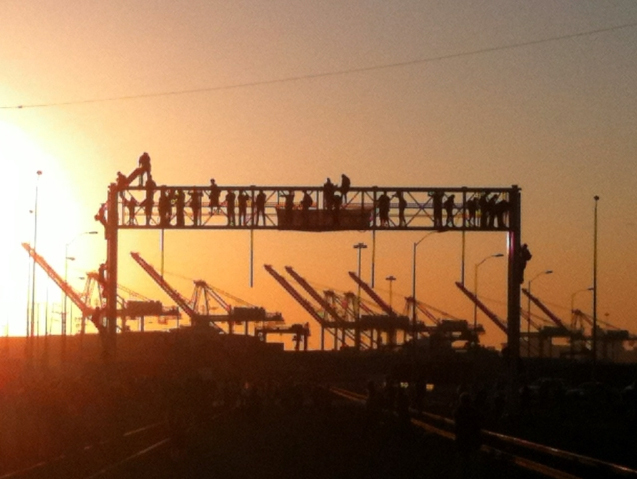 Protesters will march to the Port of Oakland to try shutting it down for the day. Many port employees, however, haven't shown up today to work, despite the fact the union leaders asked for them to come into work. 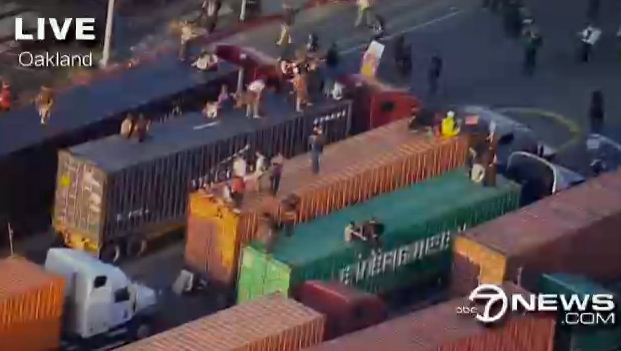 11:20: Although several media outlets are reporting that the Port of Oakland shut down today, that's not the case. The Port of Oakland is NOT closed. "The Port of Oakland is open. This includes the Port's headquarters building, Oakland International Airport, Jack London Square, and the seaport, including ferry service," Robert Bernardo, Communications Manager, explains. "At the seaport, marine terminals are generally operating, although the situation is fluid. Each of our the Port's terminals operates independently, and Port staff are in close touch with terminal operators, shipping companies, and other tenants." 12:10: Protesters plan to go after banks in Oakland. Brace. 12:15: Thousands of people have showed up to the general strike so far. 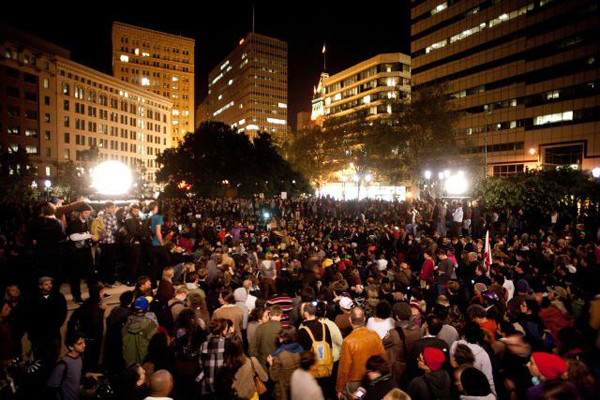 Occupy Oakland notes on their site: "Huge, enthusiastic, crowds are swirling through downtown Oakland. Police are staying away. All downtown banks have shut down. Come on down, it’s beautiful." 12:25: SFist compiled a list of Oakland businesses going "cash-only" today as a show of support for Occupy Oakland and the general strike. Check them out here. 12:30: Oakland authorities, including Mayor Quan, are now speaking about the strike. It's beeb peaceful so far with no arrests. However, there is concern about a "small group of people" in the group who turn the strike into a more heated affair. Traffic blockages at 14th and Broadway are still happening. 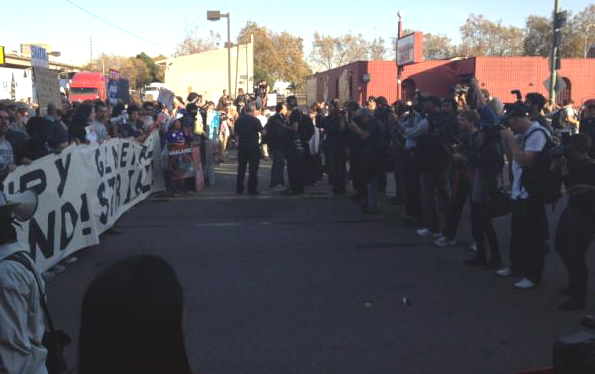 1:27: Protesters have blocked several banks in Oakland, including Wells Fargo and Chase. The WFB at 14th and Broadway has been closed immediately. According to reports, Occupy Oakland protesters have linked arms in front of the Farg, "creating a human chain that blocked customers from entering." Also, the fuzz has shut down Broadway between 17th and 12th streets "where thousands of people are now gathered for a noon rally." 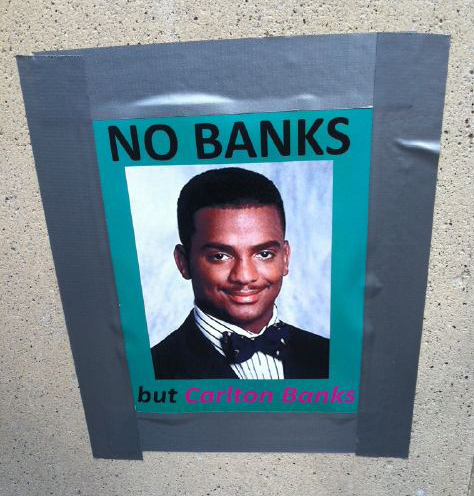 1:48: Bank of America has been shut down by protesters, according to EBX. 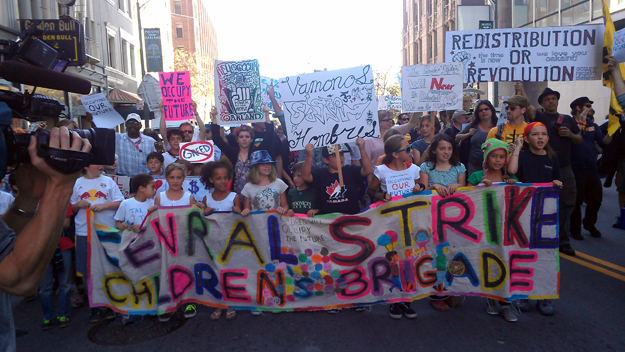 Also, the Children's March featuring hundreds of families had the marching chant: "Play Fair, Learn to Share!" 1:58: Camino, which is nowhere near downtown, is closed in solidarity with strikers. 3:00: While the protest still remains relatively peaceful, within the last half hour an "anarchist group" dressed in all black and covering their faces have wreaked havoc and tried to destroy property. 3:15: Folks are burning sage. For some annoying reason, we can only assume. Live from the general strike, Susie Cagle notes, "More goddamn sage, burning in a pile on a bike trailer. You guys it's not working." 3:22: The violence and destruction, however tiny at this point, has begun. 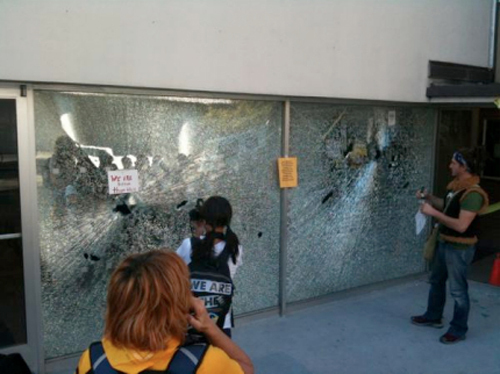 SF Bay Guardian has a great post about a broken window at an Oakland BofA shut down today. 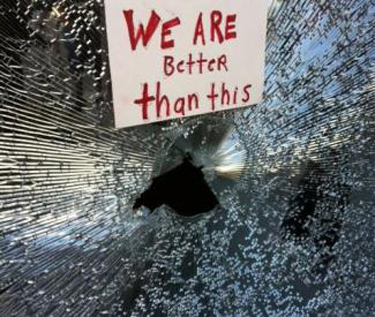 It "happened sometime after the protesters who had blocked the bank entrance walked away," says SFBG's Steve Jones, who goes on to say, "There are signs on the broken window -- one says 'We are better than this.' The other says 'This is not the 99 percent, sorry -- the 99 percent.' "
We should point out, however, that today's protest remains peaceful as a whole. We can only hope that that same sentiment will last come nightfall a few hours from now. 3:55: The anarchists are calling themselves the "Black Bloc" And many of the protesters are trying to get them to stop. Some are also snapping photos of the Black Bloc members' faces. 4:03: Fading starlet and noted anti-gay kneejerker Michelle Malkin calls Angela Davis "a Black Panthers and Communist revolutionary thug." Charming. (The UCSC professor is in attendance at today's strike.) Malkin also intentionally misleads her readers by saying that Occupy Oakland, and not splinter group the Black Bloc, are causing havoc. 4:16: While scores of Occupy Oakland protesters plan in marching to the Port of Oakland soon (around 5-6pm), the Port has sent out the following, "Employees at the Port's main office near Jack London Square have been sent home as of 3:30 PM ... As of 3:30 PM, we understand that some marine terminals are intending to continue operating through the evening and some are not. At any point, this situation may change." 4:25: ABC 7 has some live footage of the scene below. 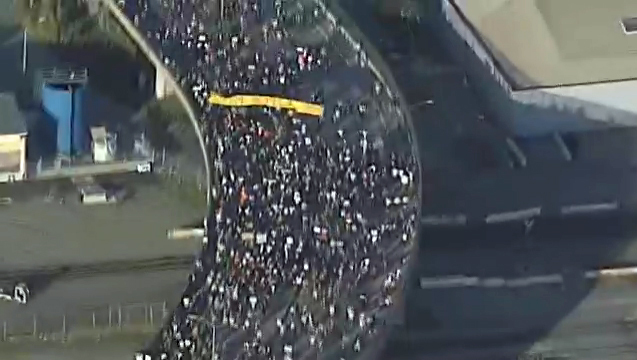 4:52: Officials estimate an 4,500 participating in the Occupy Oakland general strike. 5:25: Protesters have taken over the road leading to the port. Many protesters can be seen sitting on top of cars and big rigs (how rude!) that have come to a standstill due to the momentum of the general strike. 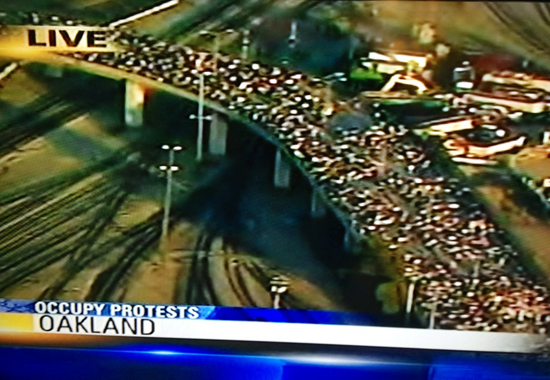 5:35: New crowd estimates: around 2,000 at Frank Ogawa Plaza; around 3,000 heading to Port of Oakland. 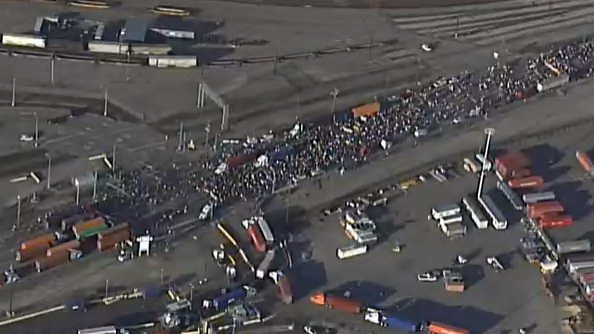 5:44: Two more images from West Oakland where protesters have officially shut down the Port of Oakland. 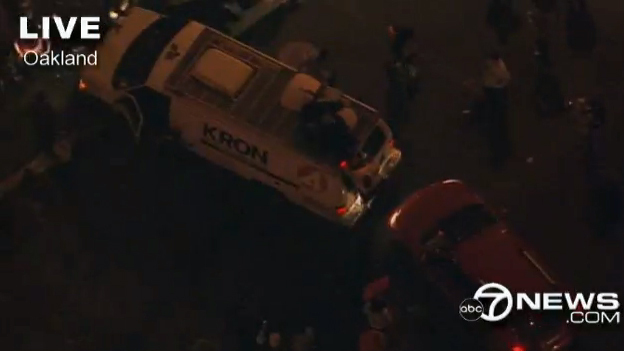 6:25: The protest, according to KTVU, is still peaceful. For now, anyway. And only a reported 5 businesses were vandalized during today's general strike. And now, nightfall comes. Hopefully, things will remain as peaceful during the night. 6:40: Protesters (on Twitter, anyway) worry that nightfall could bring out the worst in people. (Nighttime violence in Oakland?! Perish the thought.) Spectator Greg Mitchell notes, "And now it's suddenly night via Oakland livestream, which reminds me of past scenes of violence, so cross fingers." 7:45: Crowd estimation now at 7,000 - 10,000. Also, not sure exactly what's going on here, but it looks EMT are trying to get into the crowd at Port of Oakland 11th and Broadway. Firefighters and paramedics are on the scene. 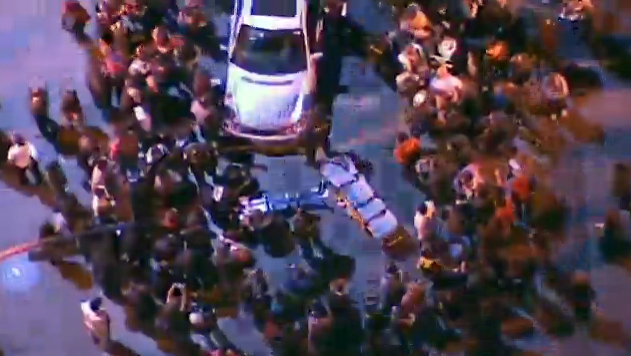 8:05: A driver hit a protester at 11th and Broadway. The pedestrian has since been sent to a nearby hospital. The driver is cooperating with authorities. 8:19: Scene at Occupy Oakland epicenter still remains peaceful. Protesters have left the Port of Oakland and returned to Frank Ogawa Plaza. Here's a shot of the crowd listening to people speak. 9:45: "No injuries, no property damage, no security problems ... we want to extend our thanks to you for keeping the peace," said the Oakland Port Executive Director during a late night press conference. Also, according to OPD Chief a question about the mild car/pedestrian collision at 11th & Broadway. Quite a day, huh? And with that we're going to call it a night. If any further skirmishes should occur, SFist will be sure to update accordingly. Until then, continue to have a harmonious evening, Bay Area. Good night. 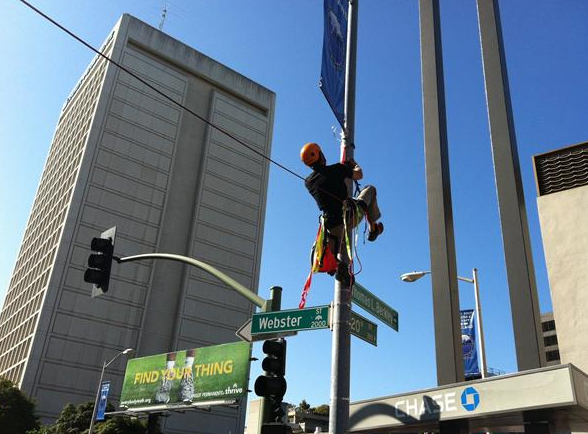 Update: 8:48 a.m.: A bit of a dustup occurred between some protesters and OPD. Read all about it.